Highway design usually isn’t a thing that museum directors have to think about, but when your northern border is an interstate, it comes up. In my very first post here, I talked a bit about my surprising meeting with TXDoT officials as part of the CityMAP project. Since that meeting back in July, there have been several articles about the project, as well as a few public listening sessions. There are so many remarkable things about this project. It apparently began with Commissioner Vandergriff in Austin noticing that Dallas has been having a lot of disagreements about highway projects (namely, whether the Trinity Toll Road should be built and whether I-345 should be torn down. For the record, I’m against the toll road and undecided on I-345). So, he realized that maybe there should be a series of conversations about what the community’s priorities are, so that when highway funding became available, he would know how to direct those funds. As I was waiting for the last of these listening sessions to begin about 10 days ago, I couldn’t help but think how shocking this whole process would be to those who planned I-30 over 50 years ago. Though I haven’t done the historical research, I’m pretty sure they didn’t do a single community listening session. Today, people are clamoring for more parks, green space and walkability. 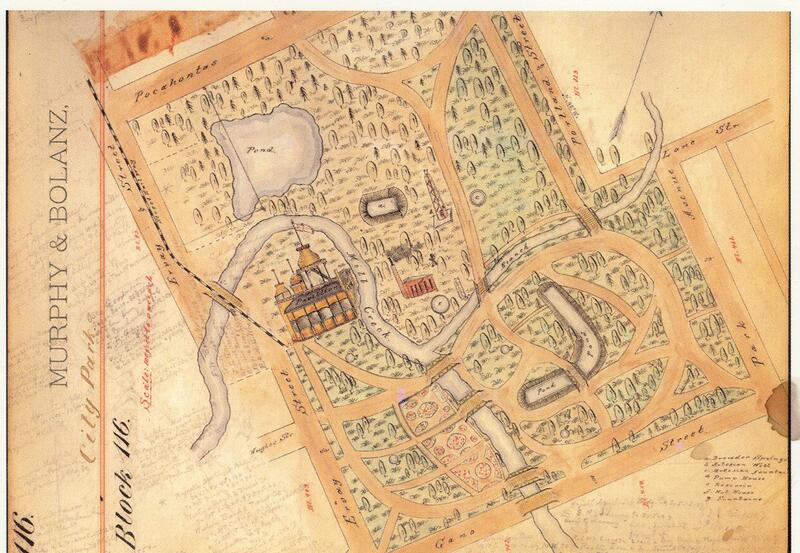 Fifty-plus years ago, they thought nothing of taking half of the land of the city’s first park. They thought very little of destroying homes and neighborhoods. For 5o years, the Cedars has been fighting to overcome the damage that highway caused. Only recently has real development begun, at least in our corner of the Cedars. And now, there are a chorus of voices asking for solutions to bridge I-30 and reconnect the Cedars, Dallas’ first residential neighborhood, with downtown. During the meet and greet, I ran into one of the architects that had been at my meeting. He said two things to me that I found pretty amazing. First, he said “You know, I keep talking about our meeting.” Though I can’t know for sure, I’m wondering if that day back in July was truly the first time they had looked at the historic aerials and realized the damage I-30 caused to traffic flow in and around downtown. That comment sure supports that suspicion (and also causes me to do a bit of a fist bump for history!). And then he said: “One of my personal goals for this project is to make sure DHV is easy to find for anyone.” I, of course, thanked him profusely. And later, I thanked him again for being an advocate for the Village. I did my duty and followed the rotation to each station, all highlighting a different area around downtown. And then I got to our map. I was with a friend who happens to live in the Cedars, so together we jumped right in. “This, deck it. Link DHV and Farmer’s Market.” And we just went from there. I think the moderators were a little surprised at our passion! During the summary portion, the Cedars moderators stated at the very beginning “Every group mentioned the need to link DHV and Farmer’s Market.” (well, actually they called us Dallas Heritage Park, but I suppose I can get over that. Maybe.) And then, the very next day, Willis Winters, the director of Parks, was interviewed on NPR. He stated that he had 3 priorities for deck parks–and DHV and Farmer’s Market was #2. So, it was a pretty good 24 hour period. Why does all this make me so happy, especially when the optimistic side of me knows it will probably be 15 years before any of this happens? Well, for years, this has been an idea DHV has been advocating, but we always felt kinda lonely. We’re not alone anymore–there are lots of people that also believe that healing the rift caused by the construction of I-30 is something that can and should be done. We have a proposed strategic plan under review by the board right now, and one of the main focuses is community involvement. One of the supporting parts of this is the need to be active and engaged in conversations about the future of our city. During one of the conversations with the board, a trustee asked “But where’s the money in this?” I had a pretty good answer for her, with actual dollars, but the real reason why it’s in the strategic plan right now is this: The conversations happening in this city right now will shape the city for the next 50 years. Dallas is at a turning point. And if we don’t want to be left behind, we have to be at the table. The visitors will come, and the money will come. But right now, we have to attend a lot of meetings, participate in a lot of conversations, and plant a lot of seeds. And in the meantime, I’m learning an awful lot about urban design and highway planning. A couple of years ago, I was sitting in a professional development workshop, taking a quiz about how connected we were with the community. The quiz deeply frustrated me—Dallas Heritage Village is located in one of the largest metropolitan areas in the country. Major institutions in the city routinely have close to a million annual visitors. Our annual budget isn’t even a million dollars. The second most visited history institution in Texas (behind the Alamo) is a few minutes’ drive away. And this quiz was asking me if the mayor had ever visited my museum? And how often other city officials attended events? I asked the facilitator: “If you’re a small organization in a big city, how can you begin to make those kinds of connections?” They stared at me blankly. Part of me wondered if perhaps there were some other ways to measure community engagement. Museum people spend a lot of time talking about becoming engaged with their community, and I think most of us acknowledge that this is a key to future sustainability. For many museums, this may mean program partnerships, collaborations, and efforts to get your audience demographics closer to your community’s demographics. This is incredibly important work, but for me, the definition of a community anchor has become infinitely more complex—and infinitely messier. Dallas Heritage Village is located on the edge of Downtown Dallas, separated by a major interstate. We are also in the middle of a redeveloping neighborhood known as the Cedars. This redevelopment has been a long time coming, but it’s also been incredibly rapid. Eighteen months ago, DHV was a virtual island; today, we’re working with 6 new partners within walking distance. When all of this began, I knew that we had to make sure we were a part of the conversations. New eyes were turning to the Cedars, and I wanted to make sure that everyone knew who we are, what we do, and that we had been here all along. And I suppose this is where my thoughts about museums and community really began to change. Internal strategic planning was put on hold, because external factors were changing too rapidly. And I started to have meetings with people that history museum directors usually don’t interact with. First, it was the real estate developers. They saw our land (27 acres in all) and said “Oh, look! A park!” And I said “Not exactly. A nationally accredited history museum in a parklike setting.” Then they said “Oh look! Parking!” And after multiple meetings drawing up a parking lease, we had to say “No, we can’t lease park land to a private developer.” Never in my wildest dreams did I imagine that I would create a folder called “Parking Issues,” but that folder is resting happily in my files because the issue will likely come up again. In January, there was a meeting called by city staff to discuss the formation of a task force for our neighborhood. But somehow, despite the fact that we are the largest landowner in the neighborhood and the fact that we are on city land, with city owned buildings and city funding, my invitation never arrived. A close relationship with our councilman and a neighborhood activist got me a seat at that very large, round table. Looking around, I was astonished to realize I was the only female at the table. And I was even more astonished when a developer (whom I had not yet met) said “No matter what our plans end up being, Dallas Heritage Village will always be the showpiece of the neighborhood.” And thus, my annoyance about not being invited in the beginning was tempered by the fact that I didn’t have to explain how valuable we are to the development plans. Then it was the traffic and transportation people. In the winter, I got an invitation to a meeting to discuss updating a strategic plan regarding transportation issues for downtown. My first thought: this must be a mistake. My second thought: Even if it is, I’m going to show up. So, I did my homework, pulled up the existing transportation plan, and discovered that there was a proposed streetcar line through the middle of our property. On a street that had been grass for several years at the time this plan was released. And with that, I had no problem fitting that meeting into my schedule. A few weeks ago, I got a call from the Texas Department of Transportation. They are currently doing a massive study and plan for all of the highways around downtown Dallas. I arrived to a meeting at a downtown high rise to be greeted by traffic engineers, urban planners and architects. Though I had been sent an official set of questions, we never got to them. They said “How does Interstate 30 affect you?” and I was off and running. I’m not sure they were expecting me to be able to talk about those bigger issues, but in the last several months, urban planning has become a lot more interesting to me. This meeting was supposed to be an hour; it lasted almost two hours, the day before a holiday weekend. But the most surprising aspect of this meeting is the way they kept asking “What did I-30 do to the neighborhood?” The last 30 minutes of the meeting were spent looking at aerial pictures of downtown pre-I-30 and talking about the damage that interstate did. (In my head, I was cheering “History at work!”) At one point, I made a comment to the traffic engineer “I hate to place all the blame on your predecessors,” and he said “Oh no. I don’t see any reason why they did what they did. This makes no sense.” In some way, that comforted me. 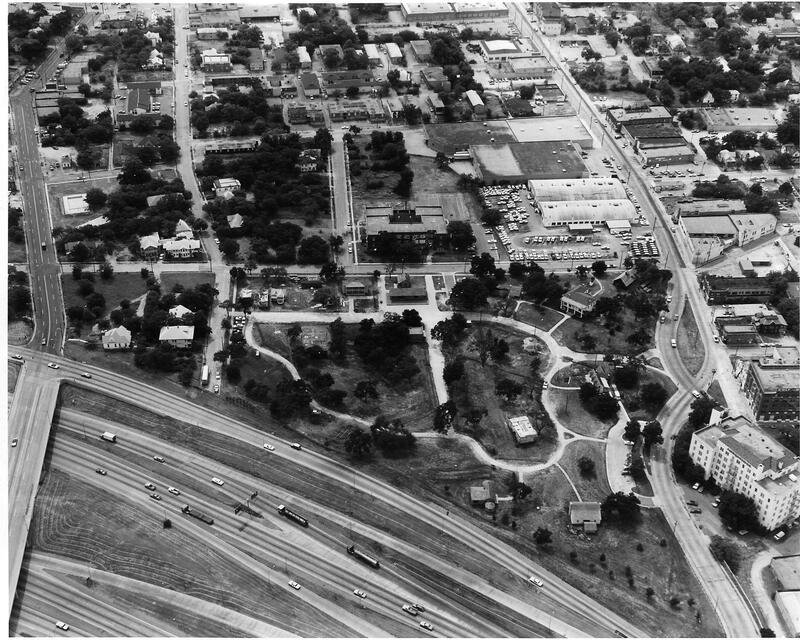 City Park, post construction of I-30. 1975. But it’s not all urban planning and real estate developers and traffic engineers. Last week, I had two meetings about the growing issue of homeless encampments along our perimeter. Our north border is the interstate, and there is a median between us and the access road. Just over a year ago, TxDoT rescinded the Criminal Trespass Affidavit it had with the Dallas Police Department. Now, the only way DPD can clear those camps is if they witness an active criminal act. Because it’s not our property, our hands are tied, but it’s deeply affecting us. Homelessness is an incredibly complex issue, and there aren’t a lot of answers for the service resistant. And yet, our historic buildings, our staff, and our visitors are at incredible risk. So, in one day, I had meetings with a VP of public safety for downtown, city attorneys, the office of our state representative, and the head of crisis intervention with the DPD. There aren’t a lot of answers, but at least I now have the assurance that we’re all working together for the same goal—finding the best solution for these individuals and the neighborhood. As a former educator, my heart will always lean towards the warm and fuzzy stories of community engagement. But from a practical standpoint, community engagement means so much more. It means getting involved in local politics—not just making sure the local politicians are invited to your events, but making sure you’re being included in the important conversations shaping your city. Sometimes it means showing up at meetings that may only have a peripheral connection to your organization. Most importantly, it means educating yourself on the issues, whether it’s urban planning, homelessness, or traffic flow. My job has changed in profound ways as a result of these efforts, and it’s also changing my museum. We’re becoming more externally focused, more flexible, and more creative. We’re becoming a community anchor, not just for the Cedars, but for all of Dallas. This blog will help me chronicle that story and hopefully provide some guidance for those that may be facing similar issues. Won’t you join me?